WIN WITHOUT WIRESThe Corsair Dark Core RGB SE gaming mouse enables you to choose between ultra-fast 1ms wireless or wired USB for optimal gaming connectivity. Create dynamic lighting effects with Corsair Utility Engine and customisable backlighting which immerses you in the game. Never run out of power with up to 24hrs of battery life with the intelligently designed Qi Wireless Charging and a high-accuracy optical sensor, for customisable reliable use on practically any type of mouse pad. Experience comfort with the Corsair Dark Core wireless gaming mouse as the contoured shape includes two interchangeable side grips. 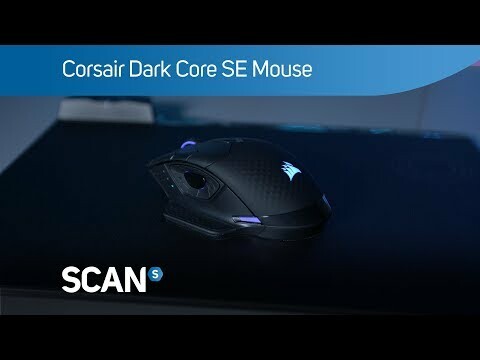 OPTIMAL GAMING CONNECTIVITY The Corsair Dark Core RGB SE gaming mouse enables you to experience ultra-fast 1ms 2.4GHz wireless connection with Bluetooth mode for optimal speed and gaming efficiency. WIRED USB CONNECTION Experience a powerful, wired connection with the Dark Core RGB SE gaming mouse. Play your favourite games with pinpoint precision, as the wired USB feature ensures you can eliminate enemies with skill and accuracy. POWER WHEN YOU NEED IT MOST The Dark Core RGB SE gaming mouse promises up to 24hrs of impressive battery life, ensuring you will never run out of power. With the intelligently designed Qi Wireless Charging feature, this makes wireless charging very simple and efficient. You can purchase any compatible Qi wireless charging pad to maximise battery potential when you need it most. RESPONSIVE SURFACE CALIBRATION The premium Dark Core RGB SE gaming mouse ensures high-accuracy and precision with the high-speed tracking engine. Featuring native 16,000 DPI resolution and a high performance Optical Sensor, which is customisable and can be tuned to virtually any type of mouse pad. Experience reliability with the high performance Omron Switches, rated for 50 Million clicks providing rapid response when you need it most for modified gaming. DYNAMIC LIGHTING WITH CORSAIR UTILITY ENGINE The exceptional Corsair Dark Core RGB SE wireless gaming mouse features nine fully programmable buttons you can assign macros to any key and create vibrant lighting effects with CORSAIR Utility Engine. Take control with Optimised Sniper Button Positioning, which allows extensive customisation you can choose anything from simple remaps to complex macros. SIMPLE ON-BOARD PROFILE STORAGE The Corsair Dark Core RGB SE gaming mouse boasts radiant multicolour backlighting, this 3-Zone customisable backlighting engrosses you in the game by providing an extensive range of lighting options. The On-Board Profile Storage feature saves your lighting effects, macros and DPI settings for total efficiency and access to your profile without requiring drivers or any additional software. 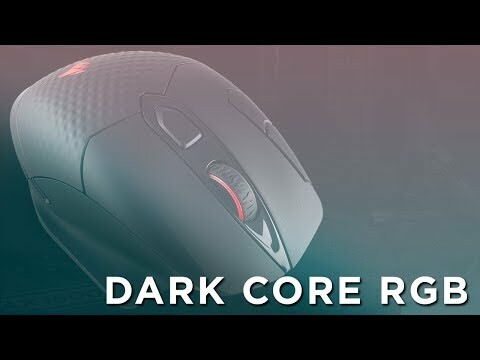 ENJOY GAMING WITH CONTOURED GRIPS The unique design of the Dark Core RGB SE makes this superior mouse especially comfortable during extended use and gaming marathons. Corsair have created two interchangeable side grips for flexibility with this contoured shape you are sure to find the perfect comfortable grip position. Corsair DARK CORE RGB SE Optical Gaming Mouse, 3-Zone RGB, 16000dpi, Wireless/Wired, 1ms, RF/BT/USB, Qi Wireless Charge is rated 2.5 out of 5 by 4. Rated 4 out of 5 by Weatherman from Its a nice mouse I am 95% happy with the mouse. I have large hands so would like the left hand side optional extension to be slightly wider so my fingers fitted better. The one I have has the Q charging built in. Its the tip of the mouse that needs to be on the charging mat so on a smaller mat use for a phone I found it fell off! I ended up buying the Corsair charging mouse mat, which is very nice. You do need to charge every night otherwise the mouse is dead by the morning. It is a very nice look and feel. Rated 4 out of 5 by RichyP82 from Quality reflects the price. This is a great mouse. Pros: Very comfortable in the hand. Fantastic battery life. Very quick charging time. Looks great. Cons: No battery indicator when switched on as LEDs used for dpi level. Indication only when switched off and charging via usb (and possibly charging wirelessly but I do not currently have access to this facility). Not a big issue as long battery life and short charge time allows for plenty of charging opportunities. Back button slightly too far forward due to size of sniper button. Need to change hand position to press it but haven't noticed it being a big issue and buttons can be reprogrammed if it becomes a big issue. Rated 1 out of 5 by Sumpte from Poor wireless performance This is actually a pretty nice mouse when wired, I really like the ergonomics, lighting options, and button layout. But the wireless performance is terrible. Despite being only 40cm away, the fact the wireless receiver is tucked behind a monitor means the mouse cursor jumps and snaps all over the place. Corsair support shrug their shoulders if you contact them about it. I'd wait for the 2nd generation of this, or better yet, get an equivalent Logitech which has better performance for half the price.